How Do You Get Copyright Permission? What Song Should I Cover? Tips on Covering Songs and How Do You Get Copyright Permission? How Do You Get Copyright Permission? Should You Even Bother? Most songs that you will consider covering will have a copyright owner (the songwriter), a publisher and their song will be registered with a tracking organization like BMI, ASCAP, or their affiliate organizations in other countries. 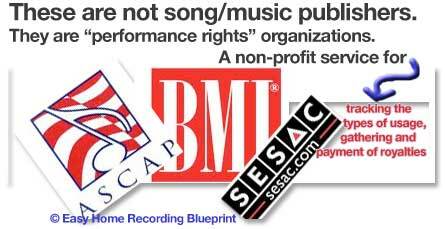 These organizations gather and then pay out royalties to songwriters and their publishers. The actual checking up, monitoring and policing of who is using a song legally or illegally is pretty much on the shoulders of the publisher and/or the original songwriter. And the truth is, it’s impossible for them to be aware of all the unofficial or illegal uses of their songs. If you have your own website and you have a variety of songs you’ve recorded and covered that is simply available to be streamed and listened to by your visitors, then there’s no pressing need to get song permission for the cover songs. I suppose, in a strict interpretation of copyright law, you are supposed to, but if you’re not selling downloads of your cover versions, then I think it’s perfectly ok to operate in the grey area of copyright law in this case. Personally, I think everyone should be allowed to upload their non-commercial cover versions to YouTube or anywhere else. It’s just plain wrong for labels and publishers to think this is harmful to their artists. And YouTube’s (i.e. Google’s) position on this is really wimpy. They really aren’t committed to any point of view. Sure, they pretend to have a point of view if someone at a label squawks. They move swiftly to remove the video and often permanently ban the user who uploaded it. 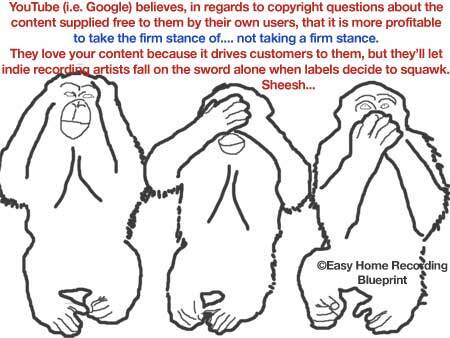 But their dirty truth is, their whole business model relies on copyright infringement all the time. 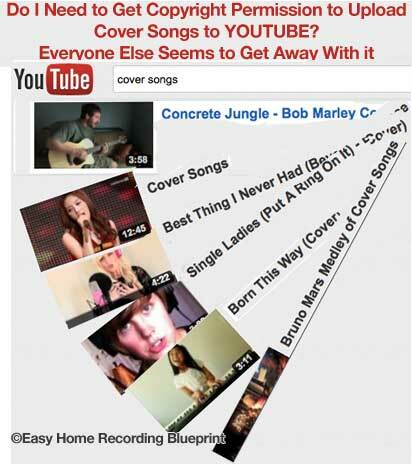 So what should indie artists do about uploading cover songs to YouTube? Here’s my advice. If you have set a goal and really want and hope that your cover song video will go viral and be shared and viewed by the thousands, then you should probably get permission to use a song so you don’t wake up one day with a permanent ban on your YouTube account. Because, ironically, the more successful you are with a cover song video, the more likely someone at a label or publisher will squawk. And that’s all it takes for YouTube to throw you under the bus. And of course, if your goal is to include a cover song on a CD or to profit from it directly in some way, then you simply must make the small investment in getting copyright permission. You will be protected legally, but also it’s the right thing to do, whether any publishers or artists are monitoring you and your project or not. It’s a sign of respect and support to your fellow recording artist and means you are part of the forces for good and not harm. Let’s talk about “cover songs” as a way of building an unknown artist’s exposure. Well, as those of you who own The Easy Home Recording Blueprint and its free companion guide, The Blueprint to Getting Heard know, before an unknown artist can “get heard” he or she has to “get found.” And one of the best ways to get found is to have your music present itself on the first page of Google or YouTube when a new listener and potential fan is searching for music like yours. You see, music fans are most often going to be searching for established songs. If you are an unknown recording artist, obviously your songs are not going to be something potential fans are going to be searching for by name. Before that happens, we’ve got to get the ball starting to roll by getting some listeners finding you and hearing you. That’s where cover songs are so useful. Because not only are listeners looking for established songs by name, thousands of listeners actually actively search for interesting alternate versions, or “covers,” of the songs they love. Although recording a cover version will give your recording some “recognizability” and will guarantee that many listeners will be carrying out YouTube and Google searches using the song’s name, your choice of which songs to cover will have a direct effect in determining your success in increasing your exposure. The trick here is to start off by choosing songs that are LESS likely to have been covered by thousands of other artists. In other words, we’ll call these “low competition cover songs.” Why? Although there will be fewer fans searching for these songs, the important upside is that you will be guaranteed to show up very high in the search results on Google and/or YouTube. 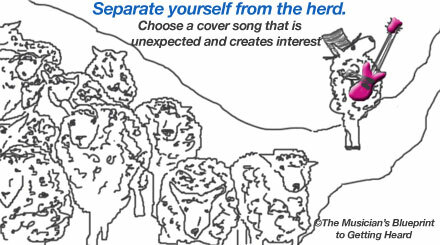 In contrast, if you choose an incredibly popular song i.e. “high competition cover song,” there many be hundreds of thousands of people searching that song’s name, BUT… your version is very likely to be buried very far down in an avalanche of other search results showing hundreds and hundreds of other versions of that song as unsigned artists and bands all clamoring to hitch their wagon to a current hit song. You are unlikely to increase your exposure or gain new listeners if you cover a “hot” song. The idea is to not be part of the herd. Remember, as soon as one sheep walks away from the herd, that’s the one that will be noticed and get the attention. * Reach back in time and do a version of one of the pioneers of that style. The artists who influenced the Stones in the first place. This would have the dual effect of impressing true Stones fans who would know about their “non-hits”, and in the second example, you would attract and gain credibility with die-hard fans with knowledge of the history of roots rock n’ roll. Either way, you would likely “start a conversation” about your cover and your music, which is what it’s all about. This happens to be the example we chose for the cover song we recorded for this article. we chose a song by a popular local artist. He is extremely popular here, but pretty much unknown in the rest of the world. In other words, he has thousands of fans, not millions. The answer to that is that the artist who we chose to cover for this article, Joel Plaskett, has a very passionate fan base and I’m sure his fans wonder why he isn’t better known. In fact, I’m sure they have noticed that not many people have recorded cover versions of his songs. HOWEVER, very soon, when these fans do a search for Joel Plaskett, they will be in for a surprise when they are presented with our version of his song in the top of their search results. So, on one hand there are thousands of people searching for this music, but almost nothing in the way (i.e. other cover versions) of our version getting heard. Our goal is to cause a “holy cow!” reaction from the fans who are searching online for this song. We simply wouldn’t get that kind of response if we covered a huge hit or world famous song. Now, some of Joel Plaskett’s fans may not like my version, no doubt. But you can bet they will be talking about it. And that’s totally cool, because reaction and discussion is what we’re after for this exercise. Have fun and put some thought into your cover song choices. Don’t assume you have to cover your heroes and their hits. Look for and consider covering songs by lesser known, but popular artists in your area, state or country. Especially if you are starting out or are totally unknown, choosing lesser known artists and songs to cover will help you gain listeners and potential fans fast. Here is Joel Plaskett’s original version of “Nowhere With You” in his signature pop/rock style, followed by my cover version. Now that I’ve recorded the cover, the next phase is to create some kind of video so I can give my version a YouTube presence. The video can be a simple photo or simple frames showing the lyrics. The main thing is to use the song’s name somewhere in the video’s title. As I said, before uploading a cover song to YouTube, I recommend making sure you take care of and answer the question, “how do you get copyright permission for a cover song?” This will protect your YouTube account from the threat of cancellation and it will enable you to offer your cover version for sale on iTunes etc. Secure the required mechanical licenses for any music at Limelight. Get Started Today. 1. 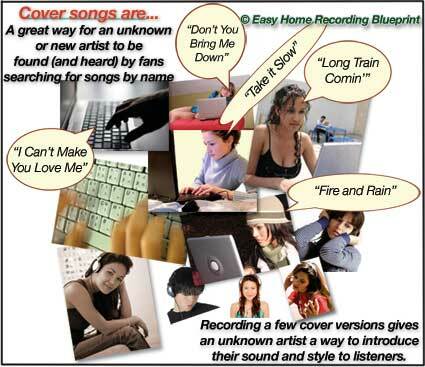 The cover song for this article was recorded using the “simple, perfect method” of The Easy Home Recording Blueprint. It’s been a cool experience recording this cover tune and writing this for you, and we’ll continue to cover some of these strategies and more in your Easy Home Recording Blueprint newsletter if you already own the Blueprint. If you aren’t an Easy Home Recording Blueprint member, you are, of course, invited to become a Blueprint recording artist. You will always be welcome, and welcomed by this great community of home recording artists around the world.